“Aurora of the Northern Lights” is a Christmas tale of an orphan girl born of a mixed marriage of human father, William, and a Northern Fey mother, Mistletoe. Though Aurora is rejected by the townsfolk after her parents die of illness, a witch gives her a beautiful crystal charm to protect her, and tells her to seek her home and destiny in the forest. In the forest Aurora meets the Woodland Fey, who also reject her as not like them, but their queen directs Aurora to the far north and gives her a warm woolen cloak and an oaken staff. Aurora trudges northward into the frozen cold white and she finds a miraculous castle. Inside she is welcomed by Santa Claus to the Great Elf Hall, where she finds a woman with dazzling white hair who remembers her mother, Mistletoe. The great white elf lady is Aurora’s grandmother, and she welcomes Aurora to a whole new world and a new life. The touching story of Aurora is told in extended verse, and the lush, contrasting dark and light paintings illustrate the story perfectly. Themes of prejudice, intolerance of difference, and courage and strength in adversity are explored. 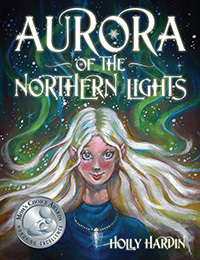 A paperback also available in ebook form, “Aurora of the Northern Lights” has extended appeal to elementary age children (8-13).